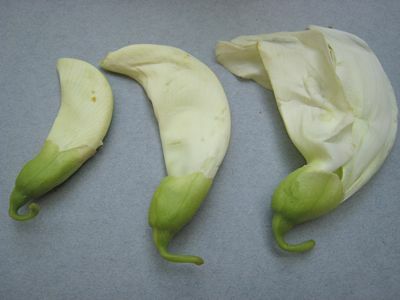 Katuray are the flowers of a small tree with light foliage (sesbania grandiflora) that thrives in arid and tough conditions, the often rather bitter tasting flowers (petals mostly) are a classic ingredient in Ilocano cooking. Along with ampalaya (bitter gourd) and other vegetables, they seem to mirror the tough conditions wrought by the geographical realities in the Ilocos region. I suspect many hundreds of years ago someone thought to cook katurai flowers for lack of better food alternatives… The tree is apparently native to this part of the world, some suggesting Indonesia as the epicenter of the species, and its flowers are enjoyed as food in Indonesia, Malaysia, the Philippines, etc. I have seen two colors of katuray in the markets, this pale greenish white and a more burgundy colored hue. At the markets this morning, I spotted a gorgeous pile of fresh katuray and purchased 250 grams worth for just PHP12. I had a dish in mind that I wanted to try it out. I miss this vegie…haven’t had it for at least 10 years when i last visited my grandma’s house in Ilocos…i used to love it in dinengdeng…i wish i can buy this in melbourne…wishful thinking! looking forward to that next post… am eager to learn something new. thanks for always sharing! Love your site! My day isn’t complete without going through your blog…..
been trying to get some stalks here in south texas to plant in my backyard. but those who have them are not eager to share a piece of their plant. maybe they do not want to be caught and prosecuted for bringing in an unapproved plant specie. i tasted katuray before and liked the salad style. anything that is bitter must be good for diabetes and hypertension so that is good to keep ones kidney healthy. I’ve eaten a lot of katurays growing up in Ilocos. You have to remove the whole carpel (I don’t know if that’s the right term) that’s in the middle of the flower. It looks like a toothpick. I’ve never had a bitter katuray. Aside from the salad preparation you had in Vigan, we used to simply grill the unopened blossoms and put some vinegar and bagoong. Oww, this is how it looks. I am going to ask an office mate of mine (he is from Ilocos) how they will cook this. Although I have not find it in the Oriental store here in Houston. Like most blogger here, my day is not complete without surfing your site. Thanks for the info that you’ve share with us. we, ilocanos put this in dinengdeng. we call it gaway-gaway in ilonggo and did you know that here in my hometown of Mandurriiao, Iloilo City, we get this flower from the roadside for free. As a child, i remembered my lola cooking it with mongo beans and dilis, added with thick coconut milk. She also add it to her sinigang and the best of all is when she makes it into enchillada. Yesterday, i picked lots of gaway gaway flowers using a long ipil ipil stick from the tree which is growing in a farm just outside our house, hoping to cook it just wat lola did, and then post it in my blog, too. can it be used as the bulaklak ng kalabasa? i have once tasted a salad made of those yellow flowers and they tasted ok.. wonder how this would taste..
We have the fuschia variety down here and have been told that it is edible. Looking forward to your recipe. We use to have this a lot when we were kids. My dad loved it as a salad and also sauted with sardines or with some other veggies. Our neighbor had a tree and my siblings and I would make sungkit the flowers. I recall my mom taking off the hard stigma or pistil that’s why I proably never recalled eating bitter katuray. My officemates laugh at me when I tell them the flower is edible. Hah, got to show them this post. One can see the katuray trees lining up some of the roadsides here in Brunei. It’s a pretty site with the trees laden with white flowers. Here it is considered ornamental. But of course our kababayans here know otherwise so at times, one can see people plucking the flowers. Without much question, they are Filipinos! Am so happy to finally know what the English translation is for Katuray……great thing to work with….happy anniversary. Lucky for me there are several katuray trees in the vacant lots in the subdivision adjacent to ours. We would normally pluck its flowers after our weekend jogging and make it into a nice salad with tomatoes, onions and vinegar dressing. Sarap with grilled liempo and/or fish! In my cousin’s backyard in Bulacan there is a viloet variety. Could it be one and the same as the burgundy type? No one harvests its flowers kasi katuray is not popular in our hometown. I also have not tried to make it into a salad yet kasi hindi ko pa alam kung edible din yun. KATURAY (among Tagalogs)is GAWAY-GAWAY in my native province of Romblon (I’m from the town of San Agustin). It’s main use in my native place is as follows: the “kinayod” (shredded) bark of the tree is rubbed against the entire length of the cotton fishing line (when nylon fishing lines were not yet available). The cotton fishing line is then dried in the sun. Result: The fishing line becomes durable and its “lifespan” (period of usability as such) is duly extended.Another use: Because it is easy to reproduce it by just planting any of its branch into the ground, it is good as fences just like the tuba-tuba (jatropha). During flowering periods it is a good place where to watch for and shoot (with a sling shot o airgun) the bats at moonless nights. The bats are fond of the nectar of its flowers.The bat meat is very delicious as adobo! An indian colleague brought several small branches of this tree in the office. She will give it to another colleague who will cook the leaves and the flowers. 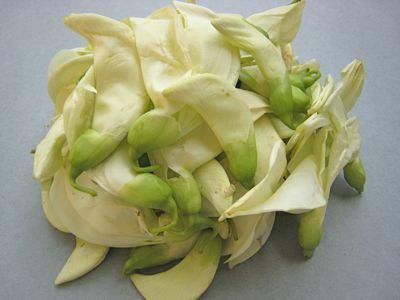 I recognise the katuray flower since we have it in our backyard and my father will blanch it for lunch. They were quite surprised that I am familiar with the flower. But I was astonished to know that they eat the leaves as well. They say it has a stronger taste than the malunggay leaves. I never tasted katuray flowers but you gave me an idea what to do with it when I find one. Weeee! Thanks for this wonderful post. 1 lived in Thailand and this flowering tree is seen everywhere. 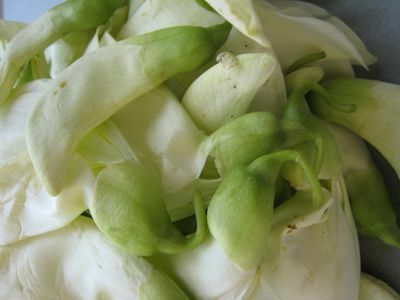 In Thailand, the flowers are cooked in a spicy broth called gaeng som or poached to be eaten with a spicy shimp paste dip. Yes! it’s bitter, you have to remove the stigmas before cooking. It’s delicious and nutrious. 1 enjoy your blog very much. Keep up the good job. Wow. So these REALLY are being eaten as food. Hehehe. I’ve only recently been introduced to it here at home (I thought it was just some weed they convinced me to eat). We often have this as a salad as “sonny sj” mentioned. I just stumbled on your site while looking for the English name of this, flower. Yes katuday is good. We have that color red flower of katuray in our backyard. I also have that seedling of this color and I shared to my officemates last month. According to my office mate they are bearing flowers right now, color red too. Next time I will include a picture of this red color so that you can see. I made a new recipe using katuray last week….. believe me, it’s really original and masarap. I made my daughter use the recipe for her class and the recipe won (despite it’s simplicity). I can’t reveal the recipe yet, not until my daughter’s teacher is done with it…. they intend to use the recipe as an entry to a contest….. I hope it wins.